After finally finishing the last Professor Layton game, I quickly jumped onto this one. I was pretty close to wrapping up Little Big Planet, but Layton is one of those elite series that takes precedence over just about anything. It also helps that the game is fairly short so it’s not as if it’ll be holding onto that spot for a long time. This sequel is very good and while the first one is certainly the better game in my opinion, this one had the better plot. 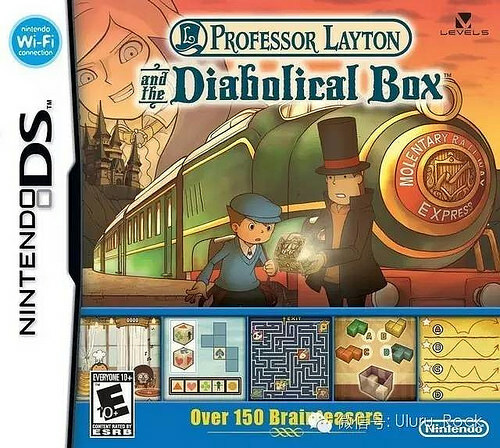 Layton and Luke head onto a train, but their adventure is quickly derailed when they find out that someone was murdered over a mysterious box. The heroes dig up some dirt on it during the first town they stop in, but the real evidence starts to appear once they hitch a ride to a ghost town. They infiltrated the royal deluxe suite in order to get in and the only problem is that they might not be able to get out again. That’s fine, they’re prepared for the dangers that may arise, but will their intellectual skills be up to the task? It’s certainly a solid follow-up to the last game and it acknowledges the first one by having their new partner Flora show up. We also get the big villain from the last game to appear again although the main villain here is a big improvement. There are a few new characters along with some old ones like the Inspector. One of the main reasons why I found the plot here to be better than the last game is that it gets to the meat of the story right away. The first game gave you a lot of time to get used to the characters and the plot didn’t start until you were well into the game. Since people are dying from the box, the stakes are higher than the first game from the get go. Things really heat up during the climax as well since we get a sword fight through one of the cutscenes and the heroes actually get kidnapped. I have to say that the whole kidnapping plot was pretty odd. The heroes hallucinated about a large gang and then the butler acted as if everything was normal. I suppose that the hallucinogens got to the heroes, but it was still an odd scene. It was an epic one as well though so I’ll take it. The game was just very entertaining and exciting from start to finish and you won’t want to tear yourself away. As always, the game paces itself pretty well. It is noticeably shorter than the last one though as I beat this game in a little over 9 hours while the last one took me around 16. Granted, I got stuck on a puzzle for a while in the last game so it should have been a lot shorter. I do think this game was easier than the last one though. Perhaps some of the test players said that the first one was too hard so they fixed it here. It’s still not extremely easy to the point where you will be bored, but now a lot of the puzzles have limited answers. This means that instead of figuring it out rationally, you can just guess all 5 or 6 of the possible choices until you get it right. The final puzzles are surprisingly easy as you will be able to solve quite a few of them at a glance. I’ve heard that the post game quests are quite challenging though so that will probably bump things up a notch. On the other hand, I do think this is possibly a smart move if the developers wanted to get more kids to play. I still don’t think a kid would be able to solve some of the puzzles from the first game. On a technical level, this game is quite solid as expected. The graphics are very clear so everything stands out nicely. You can always see a puzzle with absolute clarity so you can focus on figuring it out as opposed to thinking about what it is supposed to be. The fully animated cutscenes look really good as well and I feel like there are more of them this time around than in the first game. Having a fight in one of the cutscenes was also a blast to see. The music is also pretty catchy. It’s fairly simple, but that’s what makes it effective for the puzzles. There also is a good danger theme which plays during some of the game’s more tense moments. There is a lot of replay value here which should more than make up for the 9 hour story mode. I only beat around 90 of the missions which means there are still almost 50 left to go. That’s a lot of puzzles and naturally the ones that I left are the trickiest ones of all. I never had to stop at any point in the story mode to solve more puzzles to get to the next chapter because I had fun beating a lot of the quick n easy ones in the mean time. This does mean the toughest ones will take longer and unless you’ve got a lot of hint coins stashed away (Which is feasible since this game was really generous with them) you’ll find that this game could get to an RPG’s length very quickly. I don’t personally plan to go back and beat the rest of them soon, but maybe someday. Another aspect that helps the series is the colorful cast of characters. The Inspector is a nice ally to have around. He may not correctly guess who the culprit is most of the time, but he does try his best and is a likable enough fellow. Luke is a good kid who continues to improve when it comes to riddles. Flora is a good heroine as well and while she’s not much of a detective yet, she does like finding new riddles. Layton steals the show whenever he appears and managed to basically be a perfect lead. The recurring villain is rather bland and won’t leave an impression on you, but they can’t all be winners. I did like the voice that the game gave him when he was coming out of a disguise. The new villain was great and Katia was good enough. Poorly written characters could have held the game back so I’m glad to see that this was not a factor here. Overall, Professor Layton is a series that I’m glad to finally be apart of. I’m definitely going to get the third game as soon as possible and will probably order it once February hits. This series is just so much fun and in a way it’s good that I took so long to start it because it means that there are more games to catch up on. I believe there are 6 at the moment so I’ve got a lot of catching up to do. It makes me realize that if the Switch had gotten a Layton game for launch, that could have made things very interesting. Ah well, it’s never been a big console title anyway, but that would be fun to think about. If you played the first game then you already know what to expect. If you haven’t, you can still get into this game easy enough, but I’d recommend playing the first one first since this one builds off of that. Not to the extent where it is unplayable, but it’s nice to see the characters reference the past events. At this rate, I don’t see how a Layton game can get under an 8 so long as they don’t mess something up with the formula. It’s just a really fun and exciting game that you can play whenever you want. The controls are easy to pick up and you’ll be a whiz in no time. This entry was posted in 8 Star Games, Game Reviews, Games, Reviews and tagged Brain Teaser, DS, Game, Game Review, Level 5, Nintendo, Professor Layton, Professor Layton and the Diabolical Box, Puzzle, Review, Video Game Review by dreager1. Bookmark the permalink.